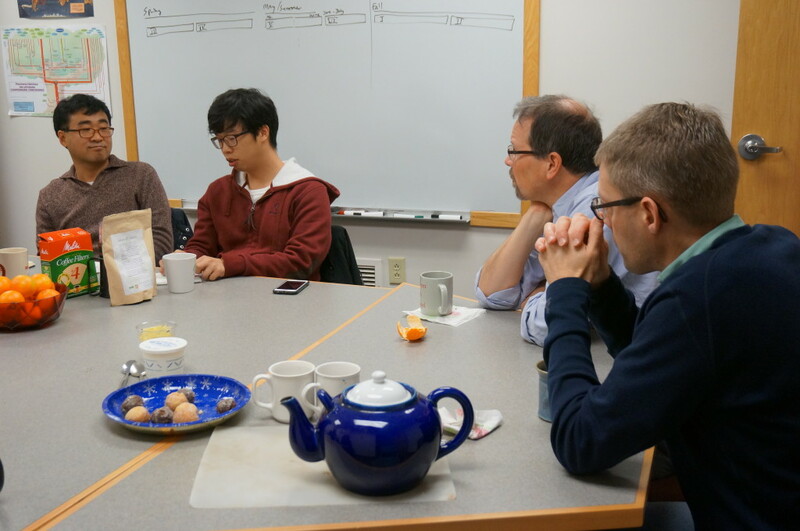 Sang-Min Lee, the South Korean Mennonite conscientious objector so many of you were praying for, visited the Institute for the Study of Global Anabaptism and Goshen College on December 8, as part of a longer visit in the United States. In April of 2014, SangMin was sentenced to eighteen months in prison for his faith-based refusal to fulfill the required military service; he was released a few months early, in July of 2015. Read more of the background of SangMin’s story here and here. 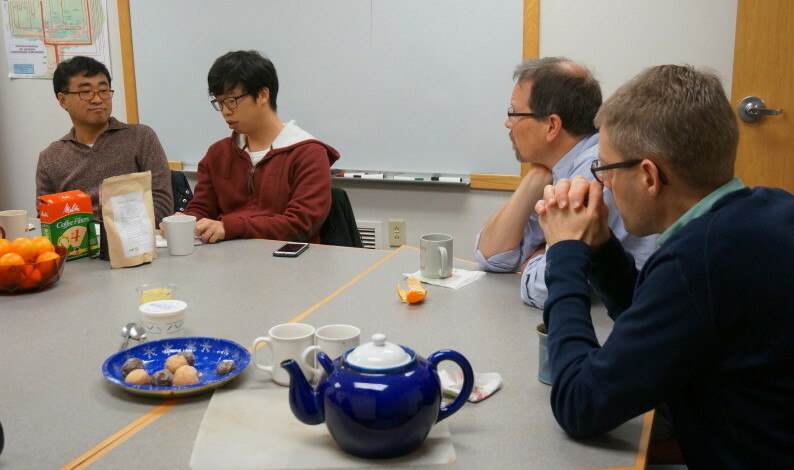 SeongHan Kim and SangMin Lee join faculty and staff at the Institute for the Study of Global Anabaptism and Goshen College for tea and conversation on December 8, 2015. Over tea and coffee yesterday, SangMin reflected on his time in prison and the impact of the international support he received. “I received so many letters from all over the world!” he said. Following his sentencing the Bearing Witness Stories Project and Justapaz organized an international letter-writing campaign, intended to encourage SangMin during his time in prison. Mennonite World Conference also invited global church members to pray for SangMin and to write to him. Of course, SangMin’s congregation in Seoul, Grace and Peace Mennonite Church, was a crucial locus of support for him during this time and delivered the letters SangMin received by email. SangMin kept all of the letters with him in his prison cell. As the stack grew, one of the guards finally confronted him. “Who are you?!? !” asked the guard. “Why do you get so many letters from outside of Korea?” He was incredulous at the quantity of letters SangMin had received from all over the world. Most meaningful to SangMin were the letters he received from conscientious objectors in Colombia. As in Korea, military service is obligatory in Colombia. And although there is a legal conscientious objection option, Colombian COs face an unpredictable legal process and significant difficulties in finishing their education and finding employment. SangMin was amazed that Colombian COs, in the midst of their own challenges and uncertainties, would seek to comfort and pray for him! While in prison SangMin was able to work as a barber, first cutting the hair of his fellow inmates and eventually of the guards and administrative staff. When he shared his story in the barber shop, SangMin was encouraged that many of his clients expressed unease with the current system of sending COs to prison for their objection to mandatory military service. SangMin continues to face challenges because of his CO status. Although he holds a degree in childhood education, he is barred from teaching because of his criminal record. Instead he is focusing his attention on bike mechanics and hopes find work at one of the bike shops in Seoul. Blessings to you, SangMin, and may Christ’s peace accompany you on this next stage of your journey!